In terms of priest numbers, we are hitting a brick wall. Some say we have already hit it. The trends have not changed. The priest shortage continues unabated. Some say we are experiencing the end of the priesthood as we have known it. "The problem is the lack of vocations, a problem the church must solve," Francis said. "We must think about whether viri probati are one possibility, but that also means discussing what tasks they could take on in remote communities. In many communities at the moment, committed women are preserving Sunday as a day of worship by holding services of the Word. But a church without the Eucharist has no strength” (National Catholic Reporter, March 10, 2017). 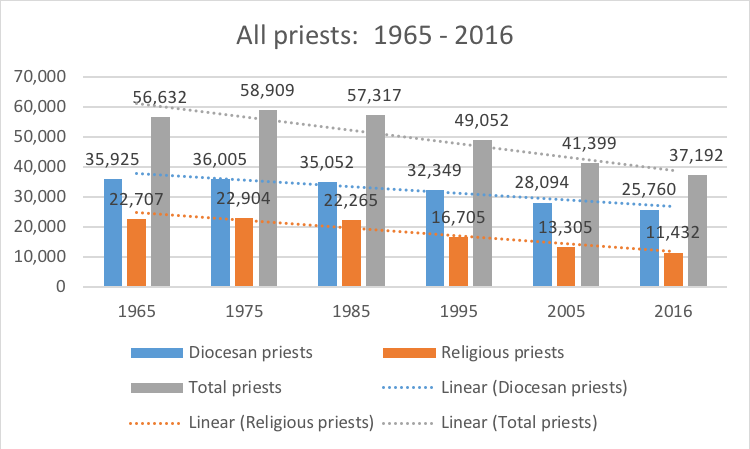 Since the Center for Applied Research in the Apostolate started tracking the numbers, the total number of priests in the United States has dropped from 58,632 in 1965 to 37,192 in 2016 with 21,440 fewer priests, a 37% drop. 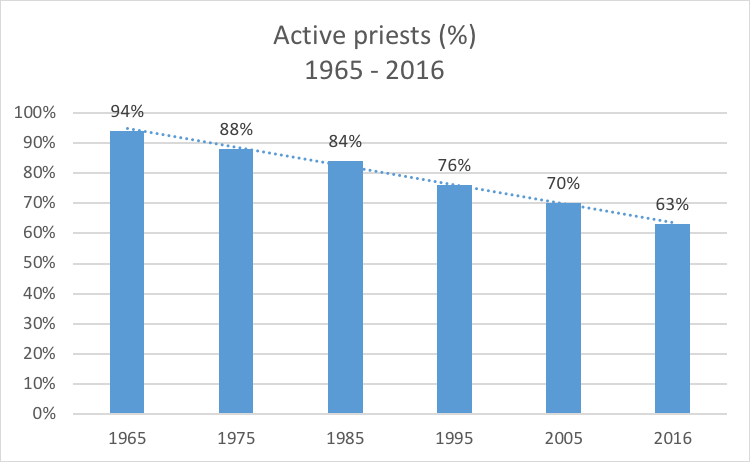 And while that number is important, the number of active priests has dropped considerably, from 94% in 1965 to 63% in 2016, and, although the number of ordinations has risen somewhat over the past year, the number of new priests is still too low to meet the needs of U.S. Catholics which have risen from 45.6m in 1965 to 67.7m in 2016. Parishes are being merged and closed. According to Center for Applied Research in the Apostolate, since 1990, nearly 2400 parishes are out of existence. Those statistics mean that the local church, the very Body of Christ that has been built up for the work of the Gospel, Catholic style, is tragically being shut down -- one living, breathing parish at a time. Still the number of parishes without priests has risen dramatically. The good news is that the laity is stepping up. 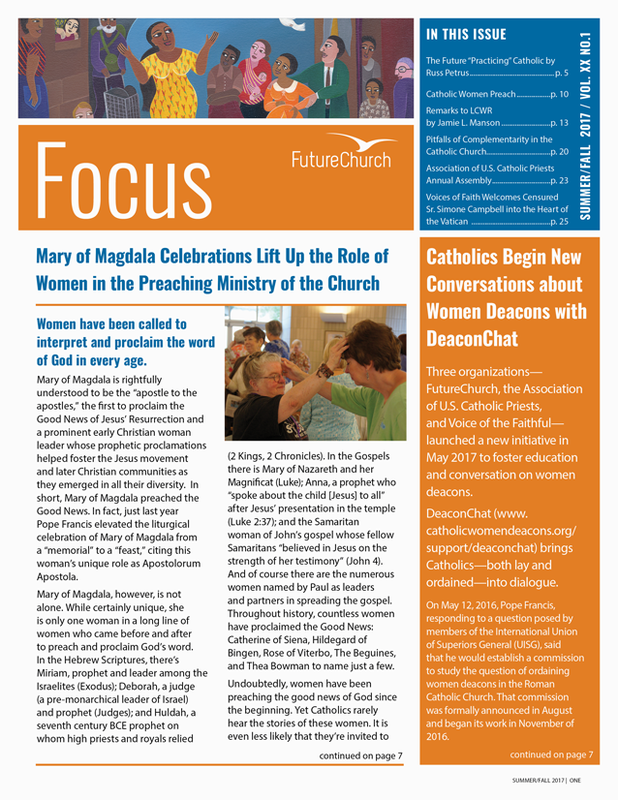 The number of Lay Ecclesial Ministers, Lay Professionals and Permanent Deacons is rising steeply. While those numbers climb, the number of parishes led by someone other than an ordained priest (Canon 517.2) is falling - another indication that our bishops are tragically slow to meet the current needs of the church. What is clear is that Catholics still care about the future of the Church. They are willing to get the training they need to carry out the work in our parishes and communities. Our upcoming series, Emerging Models of Parish and Community Life, will explore the exciting innovations that are being piloted in the U.S. and around the world. The Spirit of God lives on and the People of God are responding. FutureChurch has been providing educational and advocacy resources addressing the priest shortage since our beginning over 26 years ago.